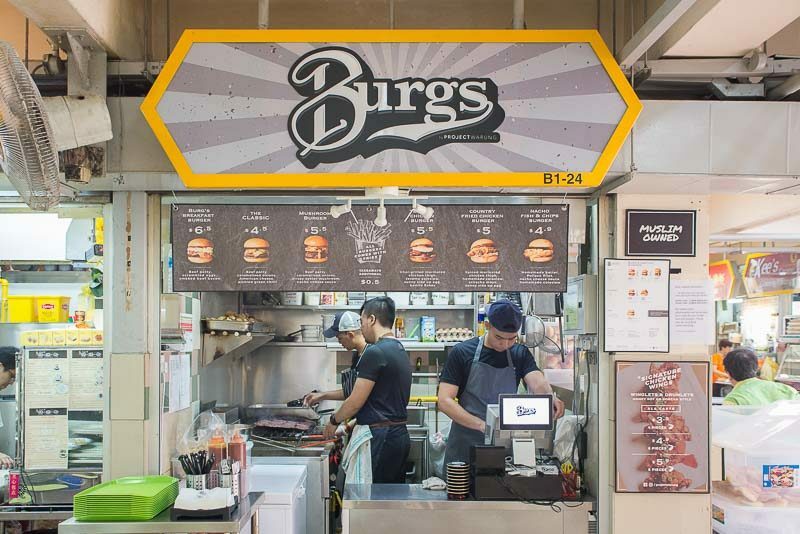 Stumbling across Burgs By Project Warung during lunch at Golden Mile Food Centre, I was drawn to the beautifully-designed storefront. I immediately checked my watch — it was only 12:30pm! And they had just open at 11am, this meant that they’ve sold out for lunch in just one and a half hours. That’s when I knew I HAD to return another day to try the burgers here. Making sure to arrive just as the stall opened for business, I was glad to have beaten the queue and took my time studying the menu. 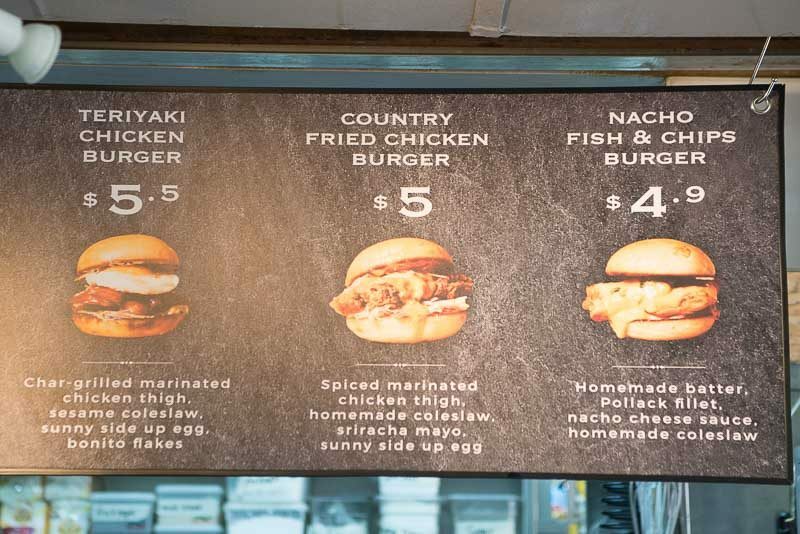 Again, I have to give praise to the menu’s design — it gave off the vibe of an upscale burger joint and really made me want to try every single burger. 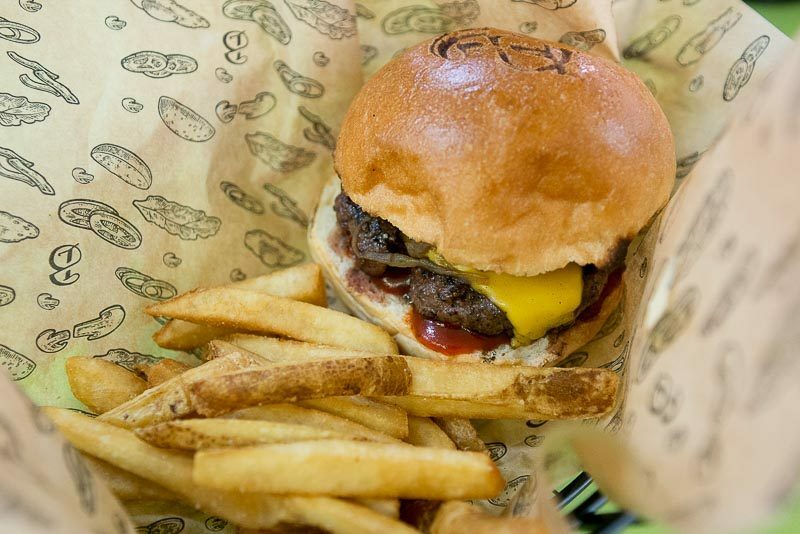 Starting from as low as $4.50 to a maximum of a mere $6.50, the burgers here also come with a side of thick cut fries, which makes for a very affordable meal. 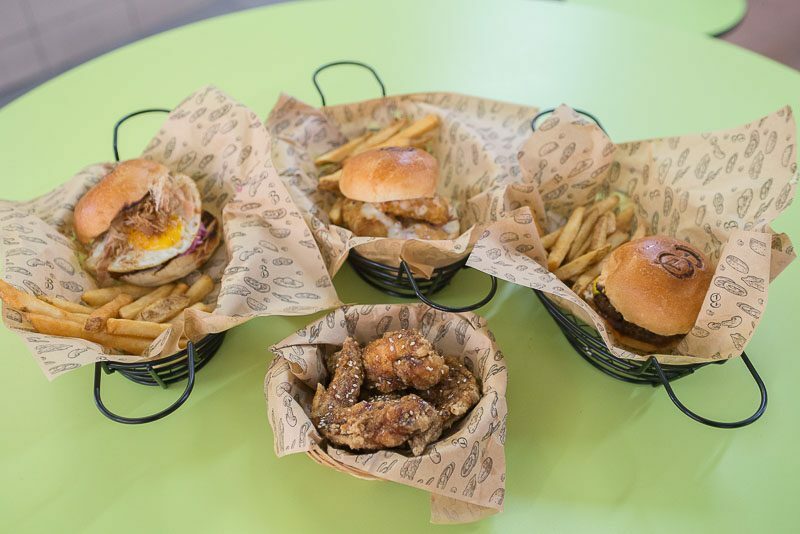 Hearing from others about their hearty portions, my dining partner and I stopped at three burger sets and small portion of wings to share. 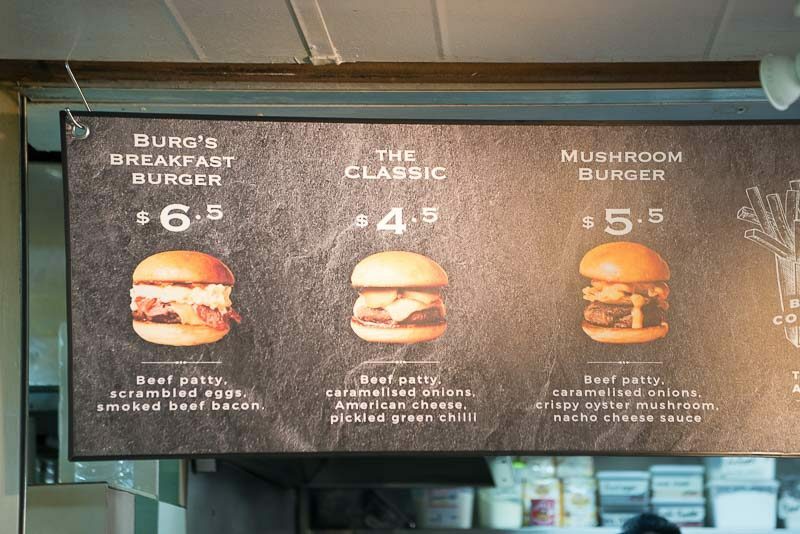 It definitely wasn’t easy choosing which three to try as I wanted to sample them all, but we settled on the approach of having a different protein for each burger. Of course, we couldn’t let ourselves leave without trying The Classic ($4.50). 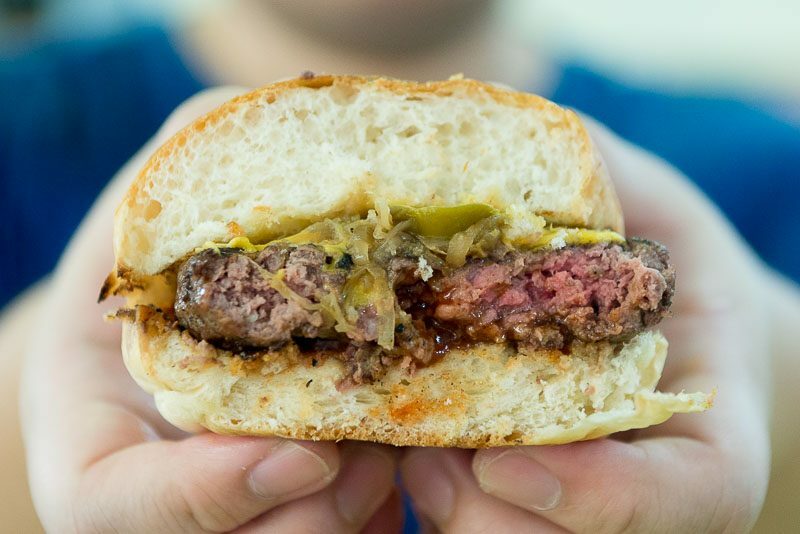 A decently thick patty of beef was accompanied by American cheese, caramelised onions and most importantly, pickled green chilli — which I appreciated as a homage to local flavours, not to mention the welcome kick of mellow spiciness that lightly permeated each bite. While the flavours were spot on, the texture didn’t score quite as well because the burger buns were a little too dense for my liking. I believe a softer and airier version of the bun that retains the same thickness would be the way to go. While it was decently succulent — it is an under $5 burger after all so expectations should be reasonable — the burger seemed to be strangely getting drier with every bite. True enough, the patty was actually cooked unevenly. One half seemed to be medium-well while the other was a medium. This led to another question: at which doneness does Burgs usually serve their burgers? Medium-well or medium? I sincerely hope it’s the latter. Because of this, my impression of The Classic was unfortunately marred a little. 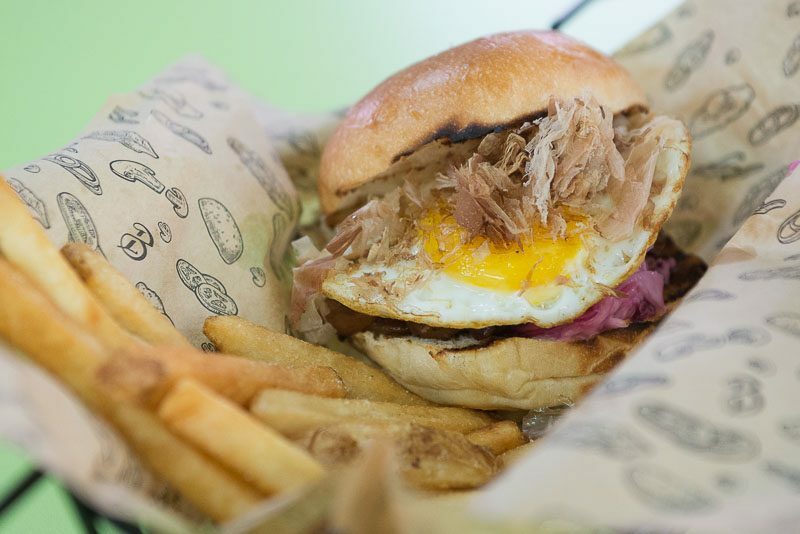 Next up was the Teriyaki Chicken Burger ($5.50) that came topped with a thick slab of teriyaki chicken thigh, sesame coleslaw, bonito flakes and a semi-runny sunny side up. I absolutely loved the combination of flavours and textures, from the juiciness of the chicken thigh to the crunchiness of the coleslaw. All the toppings worked together to make for a very satisfying mouthful with every bite. However, I have just one issue with the burger — while having a thick piece of protein is always welcome, the marinade did not penetrate deeply enough into the chicken thigh and it felt under-seasoned as a result. I would suggest leaving the chicken thighs in the teriyaki marinade for a longer period of time during the preparation process. Our third and final burger was the Nacho Fish & Chips Burger ($4.90). Spoiler alert: this was easily my favourite burger of the day. On my first bite, the light and airy batter broke apart with a satisfying crunch to reveal a moist and flaky chunk of pollock. Together with the crunchy coleslaw and mix of nacho cheese and tartar sauce, this burger excelled both in taste and texture. 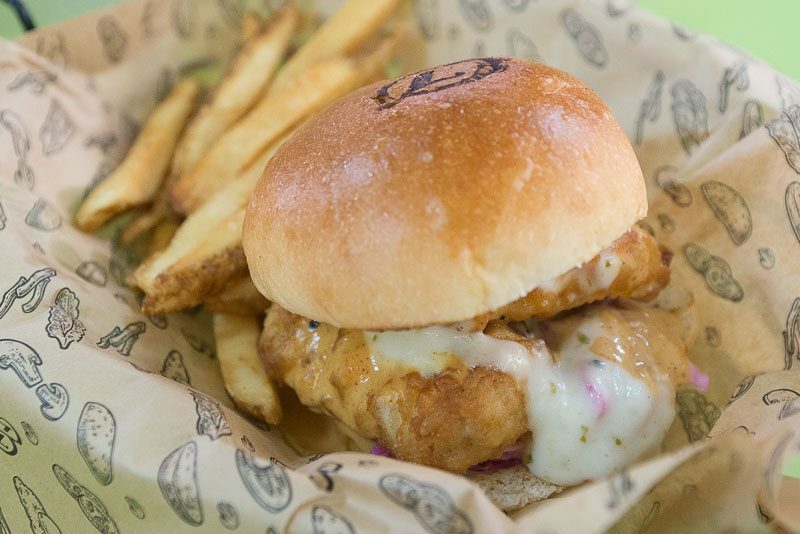 The next time I return to try the other burgers, I’m definitely getting the Nacho Fish & Chips Burger again to serve as a benchmark. To round off our meal, we had the Honey Soy Fried Chicken Wings ($4.90 for half dozen). 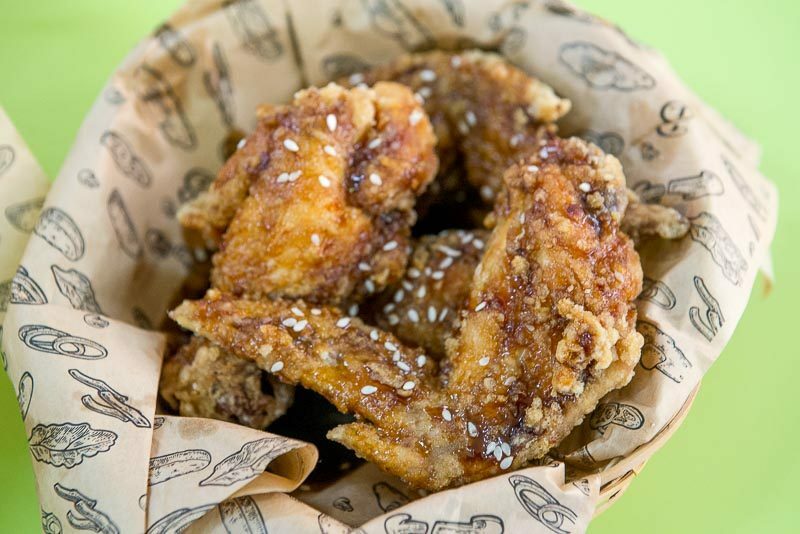 Fried to perfection, each bite of the crunchy batter of the wings and drumlets gave way to juicy and succulent chicken meat. 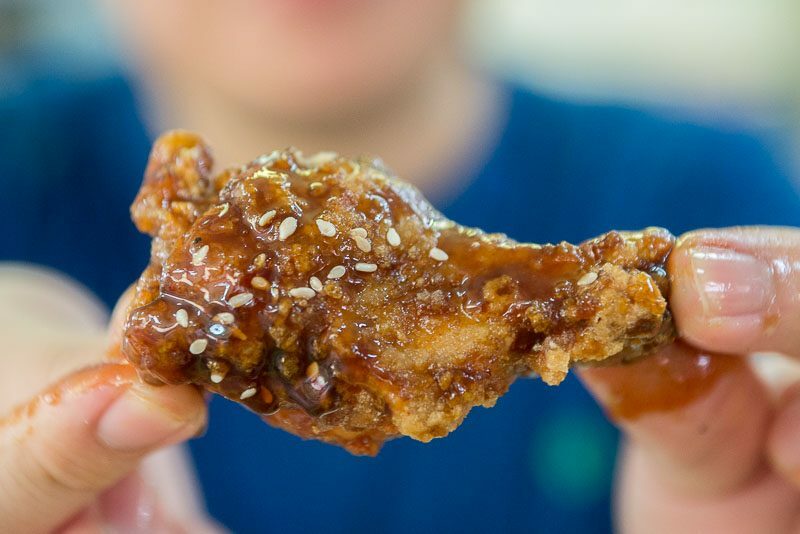 Paired with the addictive honey soy sauce, I was pleasantly surprised to find that despite being primarily a burger joint, they actually do take their wings seriously here as well. 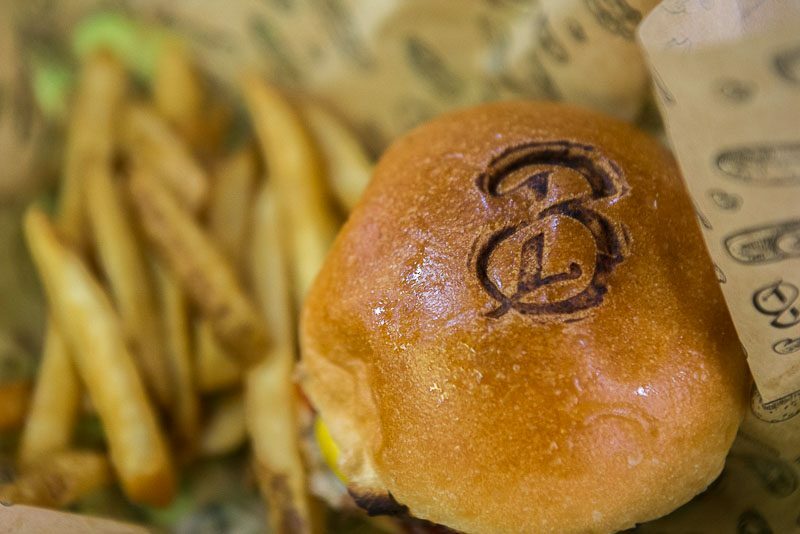 Every burger bun is branded with the stall’s logo, a reflection of the immense pride that Burgs By Project Warung takes in the food it serves. I would definitely return to try the other offerings, such as the Korean Style Chicken Wings and Chilli Cheese Fries. Burgs By Project Warung has a great concept on top of their delicious burgers so I really do hope they correct their small and fixable issues. I understand that it might be a lot to ask, especially since prices here are already so affordable. But I truly believe that Burgs By Project Warung is on the cusp of achieving something special and I eagerly anticipate its success in the future.